Thumbelina is the delightful children's fairy tale by Hans Christian Andersen. This interactive story-book will introduce children to the wonders of computers. Kids can point and click on several "Hot Spots" on each page. 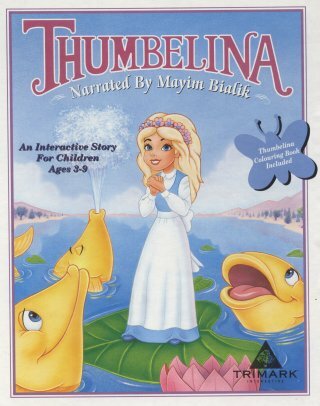 With over 17 unique characters each with their own distinctive voice and an original musical score with 4 complete songs, Thumbelina will provide hours of pleasure for your child. 12 screens, 256 colours, portrait quality art with hundreds of interactive animations and sound effects. Complete spoken narration with animated read-along text on screen with every word clickable for readover. Featuring narration by actress Mayim Bialik, star of television and the feature film "Beaches". System requirements: Apple Macintosh, 2x CD-ROM drive, 256 colours, System 7, 8 MB RAM. Works with Shapeshifter on Amiga.